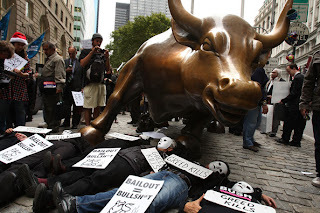 Occupy Wall Street and its kindred protests around the country are inept, incoherent and hopelessly quixotic. God, I love ’em. I love every little thing about these gloriously amateurish sit-ins. I love that they are spontaneous, leaderless and open-ended. I love that the protesters refuse to issue specific demands beyond a forceful call for economic justice. I also love that in Chicago — uniquely, thus far — demonstrators have ignored the rule about vagueness and are being ultra-specific about their goals. I love that there are no rules, just tendencies. I love that when Occupy Wall Street was denied permission to use bullhorns, demonstrators came up with an alternative straight out of Monty Python, or maybe “The Flintstones”: Have everyone within earshot repeat a speaker’s words, verbatim and in unison, so the whole crowd can hear. It works — and sounds tremendously silly. Protest movements that grow into something important tend to have a sense of humor. I can’t help but love that House Majority Leader Eric Cantor called the protests “growing mobs” and complained about fellow travelers who “have actually condoned the pitting of Americans against Americans.” This would be the same Eric Cantor who praised the Tea Party movement in its raucous, confrontational, foaming-at-the-mouth infancy as “anorganic movement” that was “about the people.” The man’s hypocrisy belongs in the Smithsonian. Most of all, I love that the Occupy protests arise at just the right moment and are aimed at just the right target. This could be the start of something big and important. “Economic justice” may mean different things to different people, but it’s not an empty phrase. It captures the sense that somehow, when we weren’t looking, the concept of fairness was deleted from our economic system — and our political lexicon. Economic injustice became the norm. Revolutionary advances in technology and globalization are the forces most responsible for the hollowing-out of the American economy. But our policymakers responded in ways that tended to accentuate, rather than ameliorate, the most damaging effects of these worldwide trends. The result is clear: a nation where the rich have become the mega-rich while the middle class has steadily lost ground, where unemployment is stuck at levels once considered unbearable, and where our political system is too dysfunctional to take the kind of bold action that would make a real difference. Eventually, the economy will limp out of this slump, and things will seem better. Fundamentally, however, nothing will have changed. Does that sound broad and unfocused? Yes, but it’s true. The Occupy Wall Street protesters saw this broad, unfocused truth — and also understood that the place to begin this movement was at the epicenter of the financial system. For most of our history, it was understood that the financial sector was supposed to perform a vital service for the economy: channeling capital to the companies where it could be most effectively used. But the rapid technological, economic and political change the world has witnessed in recent decades created myriad opportunities for Wall Street to channel capital to itself, often by inventing exotic new securities whose underpinnings may not exist. The 2008 financial crisis demonstrated the urgent need for reform. It’s not that investment bankers should be held responsible for all the ills of the world. It’s that Wall Street is emblematic of an entire economic and political system that no longer seems to have the best interests of most Americans at heart. So a ragtag group — not huge, but idealistic and determined — camps out in Lower Manhattan. A similar thing happens in two dozen other cities. And maybe a movement is born. Already, after less than a month, commentators are asking whether the Occupy protests can be transformed into a coherent political force. For now, at least, I hope not. We have no shortage of politicians in this country. What we need is more passion and energy in the service of justice. We need to be forced to answer questions that sound simplistic or naive — questions about ethics and values. Detailed policy positions can wait. At some point, these protest encampments will disappear — and, since the nation and the world will not have changed, they’ll be judged a failure. But I’ve got a hunch that this likely judgment will be wrong. I think the seed of progressive activism in the Occupy protests may grow into something very big indeed.